GET ON THE ASSEMBLY TOUR SCHEDULE NOW! When touring the USA, our goal is do book 3-5 days of shows in an area and when feasible pass on zero travel fee to you. 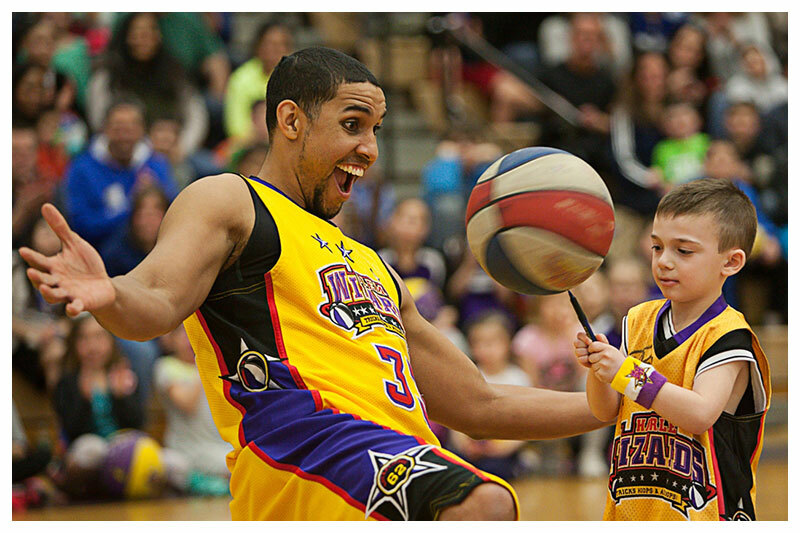 Join the THOUSANDS OF SCHOOLS that have experienced the UPLIFTING HARLEM WIZARDS assembly program since our inception in 1962 ! Picture a bigger than life basketball Wizard, whether it's our 6'9" slam dunker or our 6'0" world class trickster, they all make an INSTANT CONNECTION WITH YOUR KIDS. For the kids it's as if Michael Jordan has come to your school! This one-man show features dazzling tricks, comedy, student and teacher participation and a HEARTFELT EDUCATIONAL/LIFE MESSAGE. Virtually no audience limit for this one Wizard show (except space)! This 40-45 minute one Wizard show can be a half-court show in the gym, on stage, in the all-purpose room, or even on a blacktop. *You can share the cost with other schools-same day: 3 shows $1,350, 4 shows $1,600. FEBRUARY, MARCH AND APRIL are premium months for NY/NJ/CT & Eastern PA. Cost for a single one-man show is $950 & $1,250 for 2 shows. For NY area travel fees typically apply if over 50 miles roundtrip from our office in Moonachie, NJ. The Harlem Wizards share from personal experience many of the life lessons that are taught in the classroom. Our players deliver this fun program and then hold your students rapt attention, and reinforce your classroom teachings. Subjects they can cover include, teamwork, perseverance, sportsmanship, anti-bullying, goal setting, health, and fitness.